Come enjoy the finale and see who will be crowned the next Country Star this season! The top Contestants will return to perform live with the band Sidekick!! 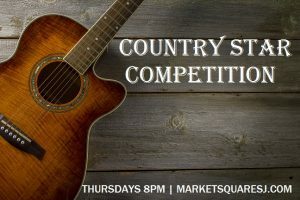 Don’t miss the announcement of the Second Place Winner of the one thousand dollar prize and the crowning of your New Country Star Winner of the FIVE THOUSAND DOLLAR grand prize!! Don’t Forget that it is #thirstday – come down to any of the Boardwalk restaurants for great food and drinks deals.